This guide is a gift for SouthernStamped.com members and their friends. We hope that it will help you in taking proper care of your jewelry. If you find the information here useful, you are welcome to share this guide with your friends. Jewelry can very easily become tarnished, dirty and dull. To keep your favorite pieces shiny, sparkling and new, proper jewelry care is the key. The wrong method of cleaning can also cause permanent damage to your jewelry! Please consider the following recommendations to ensure a long and beautiful life for your jewelry. 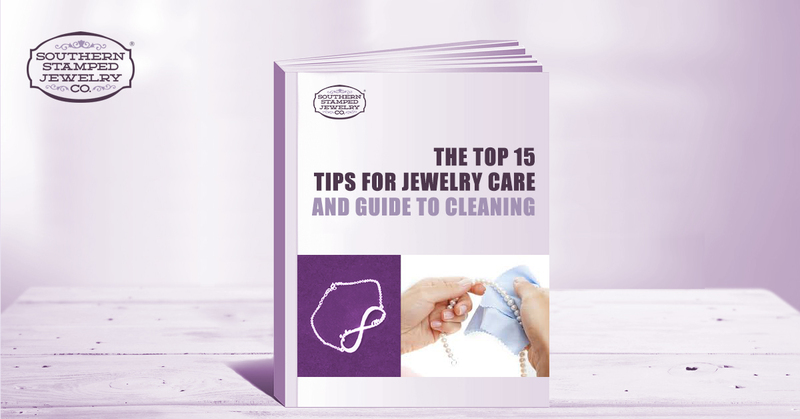 This list is not all inclusive and only provides warnings for some of the most common mistakes in cleaning jewelry. If you are ever unsure what to do please do not hesitate to contact us and we can help give personalized advice. 1) Before you start cleaning jewelry always do a quick visual check to see if there are any loose or damaged gemstones; cracked or broken metal; bent or warped prongs/tips; discolored or pitting metal. You wouldn’t want to cause any further damage. 2) Jewelry should be removed before showering or cleaning. A film can form if the soap is not washed off completely. This film will then become a magnet for dirt, dust and other contaminants. 3) Use a nub free, 100% cotton cloth and gently wipe the piece clean using only the soft pads of your fingers. 4) You can also purchase jeweler's cloths HERE. Be sure to use fresh cloths since the dirt and grit left on the cloth from a previous use will now leave scrapes and pits in the piece you are trying to clean and polish. 5) Commercial cleaners can be purchased HERE. Always remember to read the instructions on the commercial cleaners first before you attempt cleaning. 6) Never clean your jewelry in bleach! Doing this will literally breakdown your jewelry. Bleach as an oxidizing agent that will react to the metal, causing it to become very brittle. Similarly, avoid swimming pools and bathing in hot tubs as chlorine products are added to prevent bacteria growth. 7) Besides chlorine bleach, denatured alcohol, turpentine, acetone, and ammonia are harmful too. These chemicals can dull or even pit the surface on softer gemstones. 8) For best results, polish silver or gold with a jewelry polishing cloth found HERE. Use of tissue or paper towels can cause scratches because of the fibers in these products. 9) An old toothbrush is very handy. Make sure that you use an old, soft bristle brush. Lightly brush at hard to reach areas while frequently applying cleaning solution. 10) Never use toothpaste or other abrasives to clean metal or stones. Some websites recommend toothpaste as a cleaner, but this is not an accepted practice by fine jewelers. The abrasives in toothpaste can damage the surface of the metal. Toothpaste will also abrade the surface on amber, lapis, turquoise and other soft stones. 11) An ultrasonic vibrating cleaner may be appropriate for some jewelry, but always read the instructions first. Ultrasonic vibrating machines can loosen or damage precious gemstones while cleaning the jewelry. And the chemicals are not recommended for pearls and many other fine stones. Also, never ultrasonic different metals at the same time, silver can tarnish gold if cleaned together. 12) Be careful when cleaning Vermeer or plated jewelry, as it's very sensitive to any cleaning solutions. Plated or vermeil jewelry is a base metal with another layer of more precious metal (e.g. Gold) plated over or absorbed into it. This layer is not made for abrasive cleaning. 13) Always use warm NOT hot water. Cleaning agents can be absorbed and react to very hot water causing jewelry to discolor. Sterling silver is especially sensitive to hot water and can discolor in a heartbeat. 14) Be very careful when using any soaking method to clean jewelry that has soft stones such as amber, lapis lazuli, or turquoise. Extended soaking in any solution may harm the polish on the stone and cause it to discolor. 15) Substances like oil, nail polish, nail polish remover, chlorine, or perfume may react with the metal and cause it to tarnish more easily. Did you know that some jewelry boxes can do more harm than good? Are you storing your jewelry the right way? Improper storage may cause damage to your engagement rings and other jewelry. Here are some tips on storage. Although it is ideal to keep your precious pieces in a jewelry box, you have to choose a suitable one. Some jewelry boxes do not have securing areas to keep your jewelry from rolling, scratching or bumping into each other, so always separate your jewelry during storage. If possible, wrap them up individually in a soft cloth or pouch before storing. It is also important to make sure that the jewelry box is suitable for your type of jewelry. For example, some jewelry boxes are designed specifically for rings, some for necklaces and bracelets. Store silver jewelry together with anti-tarnish strips. These will absorb the agents that cause silver to tarnish. Anti-tarnish pouch and cloth are also available from jewelry stores. Basically, they function like anti-tarnish strips. You can also use silica gel as it will absorb the moisture in the air and slow down tarnishing. To prevent necklaces from tangling, you can store them in jewelry organizers, jewelry boxes or armoires. Choose those that have specifically crafted stands for hanging necklaces and bracelets. To prevent kinks, necklaces should lay flat and straight if not hung during storage. Each pair of earrings should be in its own compartment or hang on hooks. Earring posts or clips can bend and rings can wear if they are not secured to a display or insert.